Deciding to use a bold color in your home, like black, can be intimidating. But don't shy away from the option! When done right, this raven hue can make a dramatic impact even when used as a trim. From showcasing a collection of eclectic finds in a bold entryway to adding character to a white kitchen, painting this moody hue on a small section of a space is a simple and budget-friendly way to boost your style game. Here are 10 genius ways to make it happen. 1. Paint ceiling beams black to accentuate a room's unique features. If you have beams in your living room, giving them a coat of black instantly adds depth. This modern southwest space utilizes the black paint on the beams to complement the dark wood tones in the flooring. 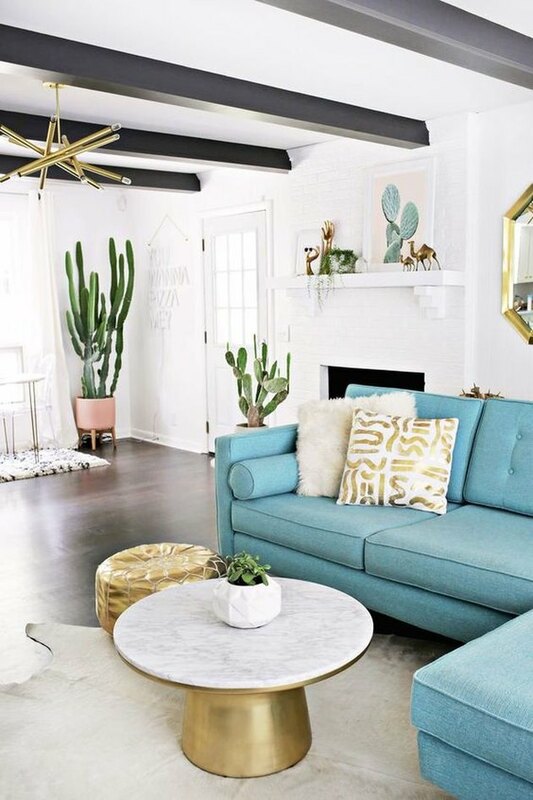 Since the ceiling beams and floor are such rich colors, keep the rest of your furniture on the lighter side of the spectrum to make the room feel balanced. 2. Make a small powder room feel like a work of art with seamless black trim. Using a graphic wallpaper is a great way to add character to a small powder room. 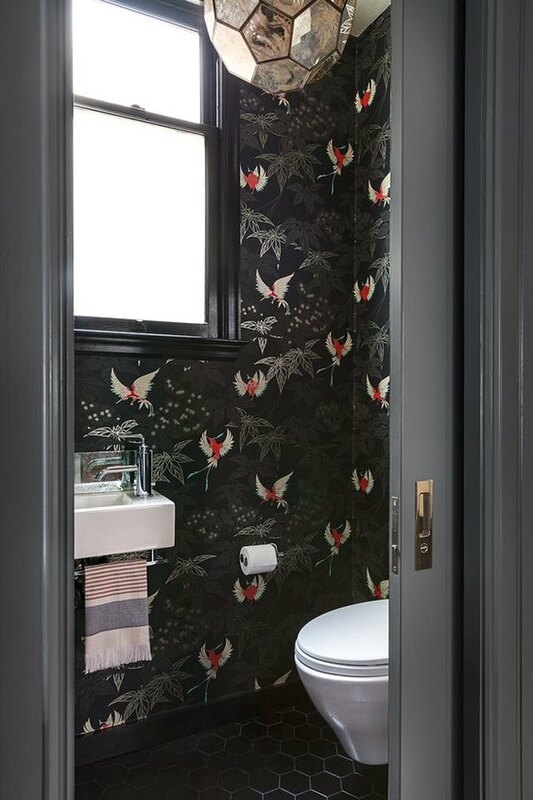 The black trim in this half bathroom blends right into the dark background of the wallpaper and gives the room a cohesive look. This is one bathroom your guests will gladly wait in line to use. 3. Add a modern touch to a classic staircase. Use a simple coat of black paint to transform a classic staircase from purely functional to a grand focal point. 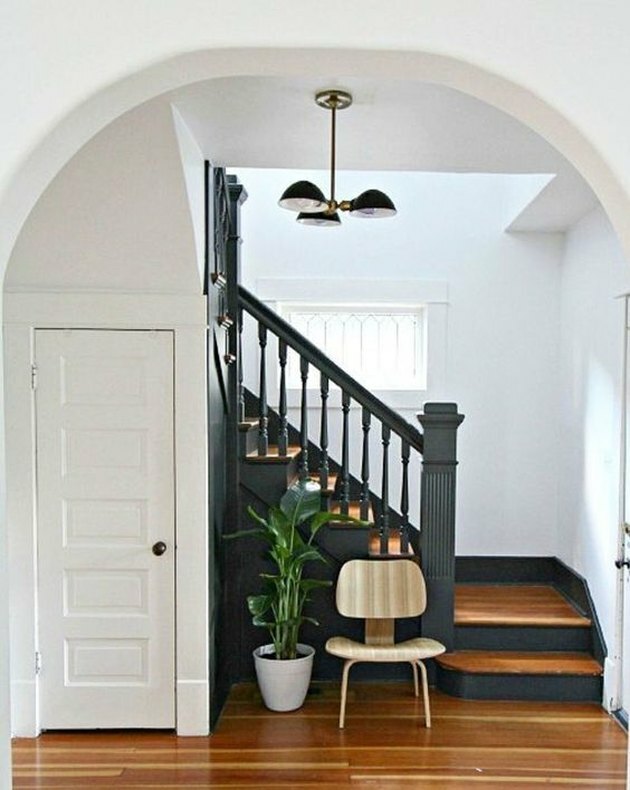 The modern touch of black on the stairs' risers and railings in contrast with the white walls and natural wood floors make this entryway seriously stylish. Add a lush green plant and a cool chair and you're done. 4. Use black crown molding to showcase a bold ceiling color. 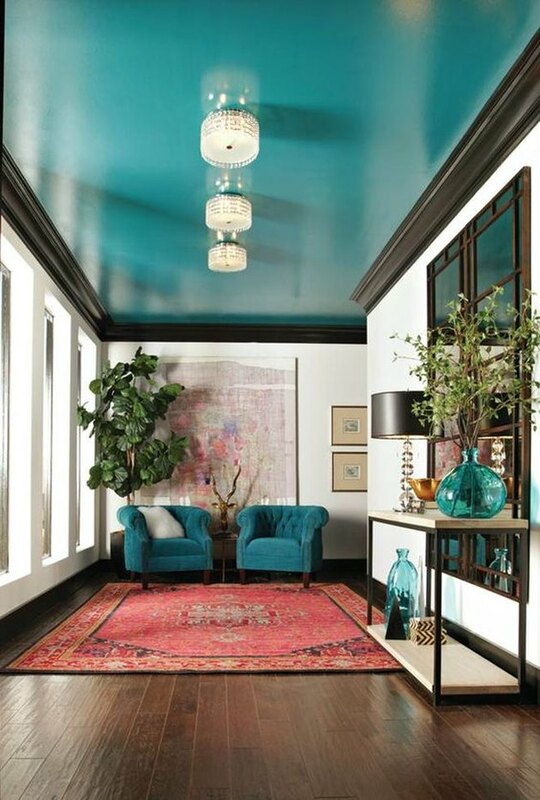 The thick black crown molding and electric turquoise ceiling gives this room a sense of confidence that can't be ignored and makes it feel larger. Adding a dark color to molding also creates a frame-like effect in a room, allowing you to play with perspective and height. And if your room doesn't have molding, there are easy DIY installation options. 5. Paint thick window casings black to make a small room feel welcoming. While it's true that lighter paint choices will make a small room seem more open, it can also leave the space feeling cold and unwelcoming if there isn't anything to offset the stark white walls. A quick coat of black paint around the window casings in this apartment highlight character and charm that might have otherwise been overlooked. The black chairs and subtle pattern on the rug help tie everything together, too. 6. Bring attention to built-ins with a black border. 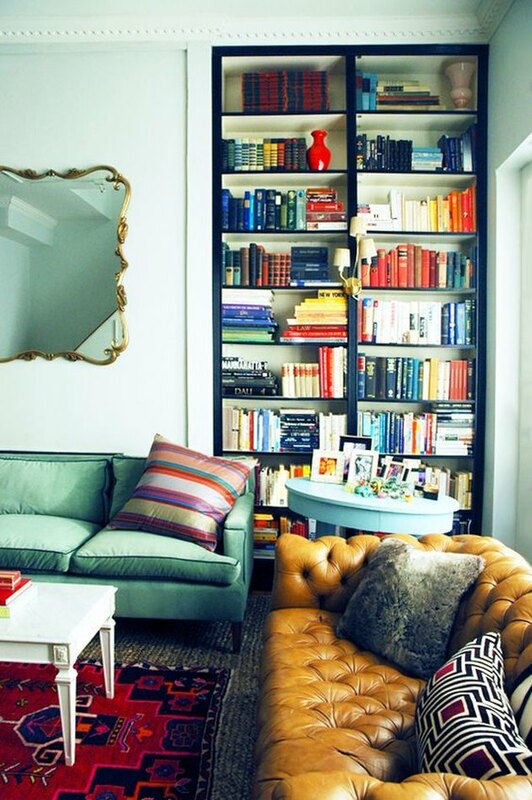 This laid back living room utilizes black paint to draw attention to a built-in bookcase that ends up doubling as decor. Leaving the inside of the shelves white also helps maintain the room's open and airy vibe. 7. 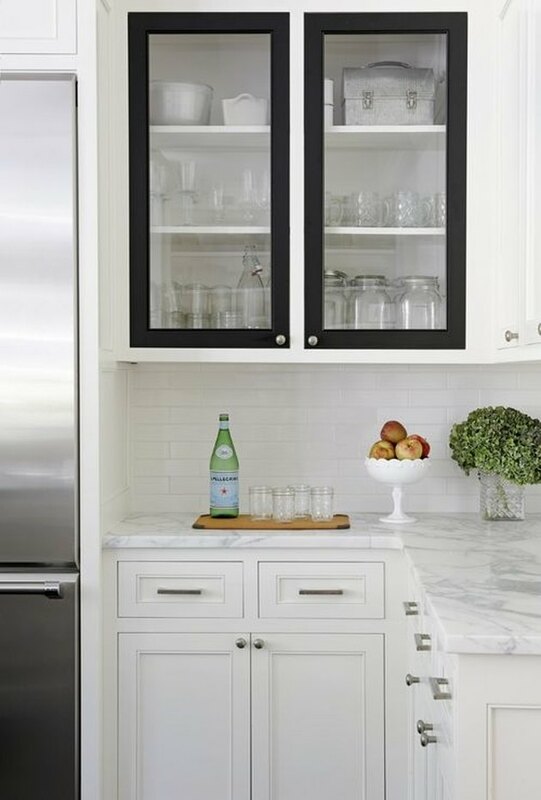 Paint a black border on cabinets to make an all-white kitchen stand out from the rest. An all-white kitchen is modern and timeless, but it can come across as bland if you don't incorporate any differentiating design elements. 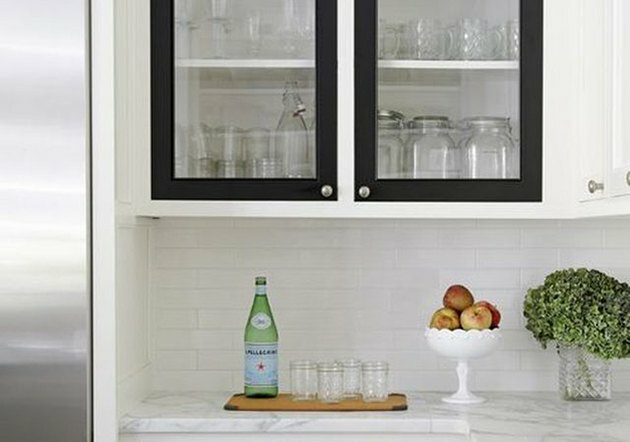 This kitchen stands out from the pack by adding a simple black border around two cabinet doors. Think of it like a picture frame and use it to display your best dishes for a kitchen that is always on trend. Plus, it's easy to change if you get sick of it down the road. 8. 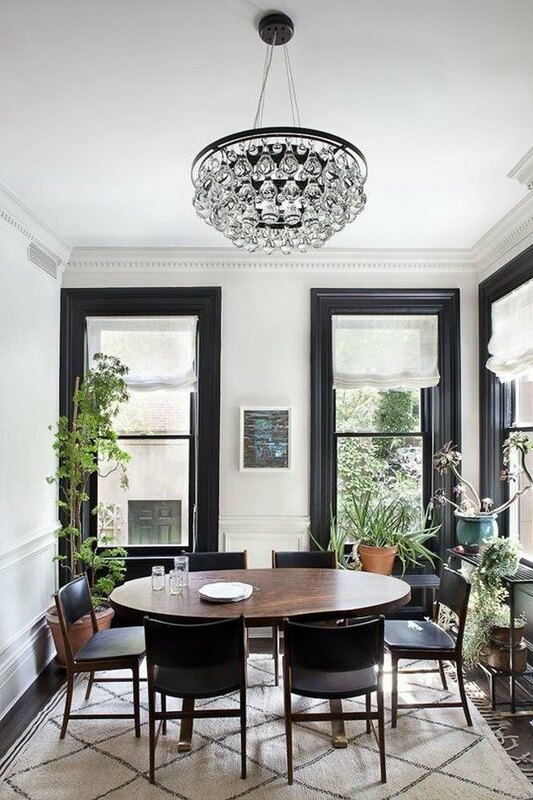 Use black trim to ground more eclectic pieces. Your entryway is the first thing you (and your guests) see when you walk through the front door, so make it as dynamic and fun as your personality. 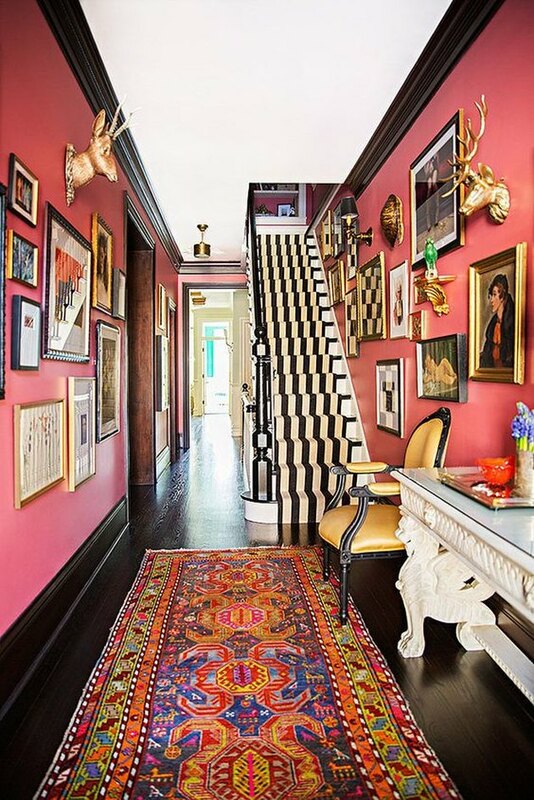 The bright pink walls, Persian rug, and art gallery of vintage prints in this eclectic entryway all work together because they are grounded between the black trim work and flooring. 9. Make a small bathroom feel bigger with black crown molding. You can never go wrong with a basic black and white color scheme. 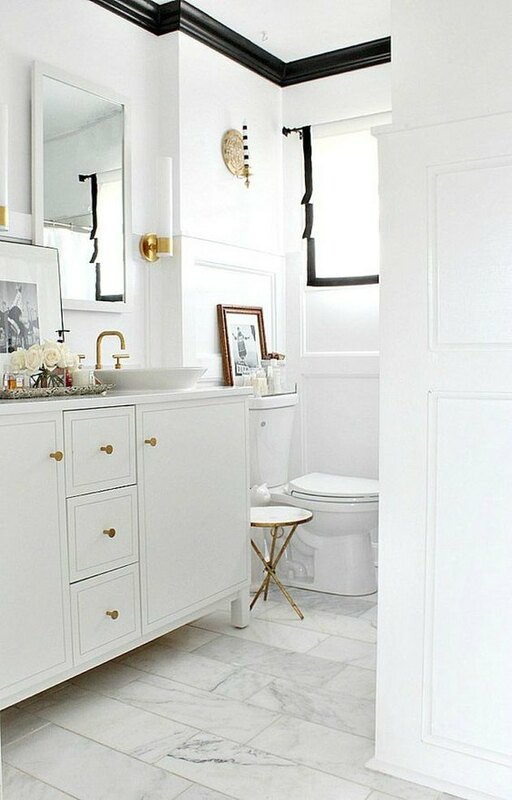 Painting the top crown molding black (and leaving the bottom white) makes a smaller bathroom appear taller since your eye is automatically drawn toward the ceiling. The addition of chic gold finishes via light fixtures and hardware also gives it a look that will never go out of style. 10. Define a transitional space with black case openings. 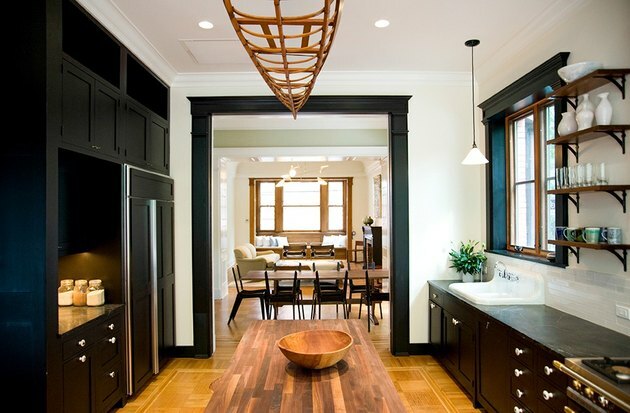 If you have a kitchen that segues into another space, try defining a passageway with black case openings. By focusing on only the trim work in the kitchen, the room feels like a separate entity while still flowing with the rest of the house. Carry the dark color throughout by adding small touches of black in each room.